The San Bernardino Valley College starter faltered early in this February 1989 game, but reliever Gabriel Pineda stepped in and provided what the team needed, according to The San Bernardino Sun. Pineda went 7.1 innings of relief in that game, allowing four runs and striking out seven to pick up the 8-7 victory, The Sun wrote. Pineda went on from San Bernardino to the pros. His minor league career lasted two seasons. He made it to single-A. 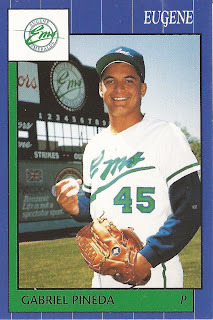 Pineda's pro career began in 1990, signing with the Royals after being taken in the 39th round of the previous year's draft out of San Bernardino Valley. At San Bernardino, Pineda took a loss in an April 1989 game, giving up three runs in two innings. With the Royals, Pineda started at short-season Eugene. He went three innings in a June game, giving up two hits, but no runs. He went two innings He pitched another two scoreless innings in a later game that month. Pineda got into 20 games in relief at Eugene in 1990. He picked up two wins and ended with a 3.57 ERA. He moved to single-A Appleton for 1991. He picked up a four-inning save in an April game. He got into 37 games overall, starting eight. He went 4-7, with a 4.91 ERA to end his minor league career. Pineda is credited as later playing in Mexico. He played for Mexico City in 1992 and later Oaxaca and Poza Rica in 1996 and 1997.